President Emeritus of the Board of Directors for the San Francisco Silent Film Festival Richard J. Meyer presented Turner Classic Movies a special tribute award for their contribution to the preservation, exhibition and education of the general public to silent films. He adamantly opined that—though this award has been given to other organizations—TCM has done more than all of the previous recipients put together towards advancing silent film. On behalf of TCM, Charles Tabesh accepted SFSFF's Distinguished Contribution to the Preservation and Restoration of World Film Heritage. "Obviously I will never claim," Tabesh qualified, "that watching a film on TCM can even compete with watching a movie in a venue like the Castro; but, I am proud that TCM is able to bring silent films to the overwhelming majority of the country that can't attend a festival like this. And I hope we aren't only satisfying existing silent film fans or classic film fans in general, but also introducing new audiences to these incredible works of art. So please count your blessings that you're here because these films are best seen in this way, experienced in this way, in the Castro Theatre with some of the best musicians that the world's ever known and some of the best performers in the world. Thank you very much to the staff of the San Francisco Silent Film Festival for this great honor. I hope we continue to live up to your high standards." Meyer then presented Robert Osborne ("who tells me more than I really want to know about Joan Crawford's underwear") with his own special award for the work he's done not only at TCM but through his writing on the history of the Oscars. "I'm really pleased to be here," Osborne admitted. "We're really always so thrilled whenever we come and we hear the enthusiasm people have for Turner Classic Movies because I think it is a great channel and a necessary channel. We're just very pleased that you respond the way you do. I do think that one of the wonderful things we've done is to have our Sunday night silent movies because it's introducing it to a whole group of people who wouldn't get to see silent films otherwise or they're used to seeing them only in butchered versions run at the wrong camera speed. At TCM we get these wonderful prints and you get to see what it was like when they were making these wonderful films. So it's a great honor and I also agree with Charlie that there's nothing like seeing a film in a theater on a big screen. The values are all different and its great to share with other people. There's nothing like that experience and I'm so thrilled—Nazimova would have been so thrilled—that you've packed this house tonight. She'd be absolutely delighted. I am glad that we have Turner because we wouldn't get to see a lot of these films otherwise and, of course, if you don't live in a great city like San Francisco or can travel here like you've done, you don't get a chance to see these films. We [at TCM] are grateful for our chance to bring these films to you. We're grateful that you're out there watching them and appreciating the channel as much as you do. "I'm going to talk a little bit about Camille right now. It came out in 1921. It was very much a product of Nazimova. She was a great great star at that time and this is very much—as you will see right from the beginning—absolutely a Nazimova production because it's Nazimova in Camille and then it's a Nazimova production and her name is always kind of written in script and also it's very curious, you don't see Rudolph Valentino's name at all in the credits except when they list the characters; he's there. Thereby hangs a tale. When this movie was made, Nazimova was 42 years old. She was a great great star, curiously, and I say that because she's not somebody you'd automatically think would be a great star [who] would be beloved by people all over the country; but, they did, during this period of time. This was her 11th film at the Metro company—her 11th and last film there—and the public did love her; she made $13,000 a week, as compared to Rudolph Valentino who in this film made $350 a week. "What's interesting is she's very theatrical. In this movie she has bee-stung lips and she's got a hair-do that looks like her head has exploded. She's very theatrical but we have to realize that in 1921 that was the way that actors performed. It got a little less so of course when you get into the later '20s and silent films were really at their apex and people were much more natural acting and all that. The interesting thing in this film is that Valentino is very natural and low-key and she's very theatrical. I think that's interesting to watch the two mix. This film came at a time when Nazimova was hugely successful, very famous. Rudolph Valentino was actually cast in this film when he was an unknown. "Nazimova was very much in charge. She hired Natacha Rambova, who was this very interesting woman, as the art director who later married Rudolph Valentino. [Camille] is set in France in 1921—it's kind of an updated Camille—but still it's very German Expressionism in the settings and art deco. You'll see one scene where they go into a casino and a whole side of the wall is like a white spiderweb. It's all very kind of bizarre; but, that's Rambova; that's her signature. Also, the script is by June Mathis [based on La Dame aux Camélias by Alexandre Dumas] who was a very important script writer. June Mathis had been the one who had gotten Metro to sign Rudolph Valentino for Four Horsemen of the Apocalypse. At the point that he was signed for this movie, he had just filmed Four Horsemen but it hadn't opened yet. This film went into production in late February of 1921 and two weeks later on, I think, March 6th of 1921, The Four Horsemen of the Apocalypse opened and all of a sudden this guy who Nazimova had hired kind of as an afterthought—because she wasn't planning to spend much time with Armand in this movie; this was all going to be about her—all of a sudden he became the hottest new star in the world, almost overnight. Everybody went crazy for Valentino. All of a sudden [while] making this film, the dynamics had changed. This fellow who was totally unknown, who was an afterthought, people were waiting outside of the studio to get his picture, fans were lining up, and people were going crazy about him. As somebody said, Nazimova never wanted to share with a male on screen so she wasn't too keen about this. 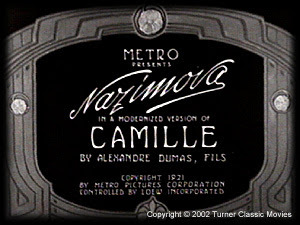 So much so—and I'm not going to give away the ending—but, it's interesting because this is definitely Nazimova's Camille, this is not Alexandre Dumas, because it ends in a totally different way than Traviata or any other Camille you've ever seen. The structure of the story is very much the same as it was in Greta Garbo's Camille when she did it, except for the finish; it's pure Nazimova. "When the film opened it was a moderate success for 1921 but it didn't have enough Valentino in it for the fans who were now ragingly mad about him. In the meantime, a film he'd made later called The Conquering Tower had opened in July of '21 and right around the corner was—and everybody knew it was—his big hit The Sheik was about to open; that was in November of 1921. So people didn't pay a lot of attention to this film. "Nazimova—after this film checked off the Metro lot; it was the last of her 11 films for them—immediately what they did was, they couldn't change the credits of the film, but they did change the ad campaign. So all of a sudden the ads all said: Rudolph Valentino in Camille with [in much smaller letters] Alla Nazimova. [She was] not too pleased about that. Anyway, I think that what's interesting to keep in mind is that she is very exaggerated and theatrical and in a way over the top in this movie; but, she was also really a wonderful actress. If you're fans of movies of the '40s, she made two wonderful—well, three actually—films as a character actress in which she's very naturalistic in her acting and interesting. One was Escape  with Robert Taylor and Norma Shearer, where she plays Robert Taylor's mother. The other one is Blood in the Sand  where she's Tyrone Power's mother, and then she has a wonderful sequence with Claudette Colbert in the 1944 film Since You Went Away, which is a very touching scene where she plays an immigrant who tells Claudette Colbert who's working in a defense plant about what seeing the Statue of Liberty and what it says at the base of the Statue of Liberty means to her. She's very low-key [in that performance] and really a wonderful actress, so [in Camille] she was obviously acting the style of the day when she made this film. But it's great fun to watch, particularly if you know Camille through Garbo or through many other versions of it. So we bring it to you now, happily, from Turner Classic Movies and the San Francisco Silent Film Festival!" Although the score in the TCM broadcast of Camille (captured in its entirety on YouTube) is an original composition by Peter Vatine, the SFSFF screening was accompanied on the Mighty Wurlitzer by the dramatic and popular Clark Wilson.